I wanted to talk with you about workplace violence and supervisor relationships. 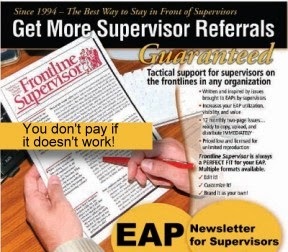 EAPs routinely help resolve problematic relationships that employees have with their supervisors. If you haven't worked with this type of issue yet, you will. I believe this intervention activity that HR managers, EAPs, and even OD people sometimes tackle has the most potential to improve productivity, reduce risk of violence, and help insulate the company from lawsuits -- big ones. The role EAPs play in helping resolve employee-supervisor conflict should get more attention in the literature. I have always believed that effective EAP models reduce the number of potentially violent acts that, as a result, never happen. The question is, do companies appreciate this enormous benefit that can't be easily proven? Many of these cases begin with employees who have problems with supervisors. These problems don't just create conflict and distraction. They can lead to death by a violent act. 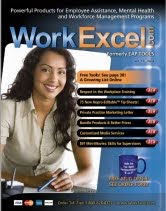 The subject of violence and improving relationships with supervisors is so critical to safety that I always include articles about it during the year when writing WorkExcel.com\'s newsletters. I so badly want to produce 7-9 minute Flash movie on "Best Tips for Reducing Supervisory Conflict with Subordinates" I think this would prevent violent acts more than the usual "know the nearest exit to your office if your employee explodes." Employees love tips for improving their relationships with supervisors. There are huge payoffs for providing them, and top management will love you for doing so. That's because management can't rally employees to improve their relationships with their supervisors. The dynamics of paycheck-driven relationships simply makes it impossible. Your newsletter is a perfect medium for doing it. Here are a few topics to consider for your next newsletter and those down the road. Chase after your newsletter company to write about these topics. If you are in a pinch, have them send me an e-mail and I will reply with my thoughts. They shouldn't have any problem if the writers possess an EAP background, of course. 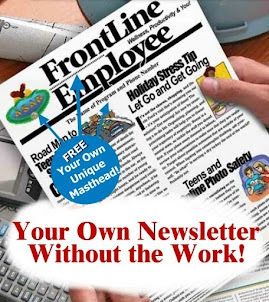 * Understanding that your supervisor is probably not "out to get you"
Don't just make a newsletter entertaining for employees. Make it a loss-prevention tool for the company. These tips will reduce conflict, improve program utilization, and increase top management's awareness for your true value.